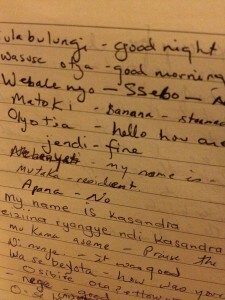 One journal page that catalogued the many words/phrases I learned in Uganda. Since I returned, I have had the joy of being able to continue my Swahili lessons here in DC with Freddy, my friend’s building manager. It’s great to hear and talk Swahili, even if my ability ends at “hi, how are you?” I have also recently started dusting off my French skills, while attempting to learn Arabic and pick up Spanish from one of my new roommates. So, getting in touch with my lingual brain has been a great exercise recently. Though don’t get yourself excited, there is little way I am going to be fluent in all 4 languages anytime soon. There’s a funny story from my French speaking days. I remember walking off the plane at Charles de Gaulle airport in Paris and hearing a huge group of people speak French around me. My first thought was, “Wow, they did really well in French class.” Then in the next moment, I realized what I just thought and was laughing so hard, that because I was alone, and not on the phone, I am sure I added to their stero-type of crazy Americans. I bring this up because while I love being able to greet Freddy, it doesn’t seem like what I am saying is real. It seems like a game, where I happen to know the rules. I remember that same sensation in Uganda. I would frequently thank someone in Rukiga and then follow up with English, to “make it real.” I’ve also heard this in the preschool play yard, when kids play pretend by mimicking the adults around them, without knowing what they are saying. Today I began to wonder just how long we carry this behavior with us, and in how many circumstances. How often do we “play” or mimic right behavior before we feel like its real, before we really understand enough to hold our own self-directed conversations? For many years I have laughed when people say, “oh, you’re finally an adult, (now that you own a house, sold a house. 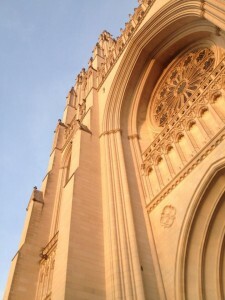 married, had kids, etc)” I never liked the idea of defining my adulthood, with acquiring things, or people. I didn’t think adulthood came from these “milestones.” However, I still never felt like what I supposed an adult felt like, from the vague idea I developed while watching them as I grew up, and on TV. I was sure that with adulthood there was a confidence, a moment when you knew what to do in any situation and that moment had just not happened. I never consciously felt like I was mimicking an adult, however it occurred to me while I was in Uganda that somehow, somewhere I actually, finally, felt like an adult. I knew I was an adult all along and had owned a house, paid bills, held steady jobs, and had relationships, but now I consciously felt adulthood. I finally understood what I was doing, and being, and didn’t need to qualify or repeat to “make it real.” I realized I actually didn’t need to mimic the adults around me, because I finally understood, that no one knew anything for sure. For me this was the moment I finally understood the language of adults, that we never really know what is going to happen, or really what to do. Though, some people live their life pretending to know, or enamored with the illusion of certainty, in reality we just muddle through and try to remain true to ourselves and, for me, the spirit of love. We can live our lives as self-directed conversations with our perceptions, what we want in life, and how we can or should achieve them.